It was a night of tragedy. 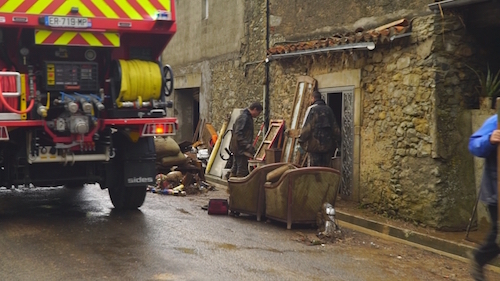 Between Sunday October 14 and Monday October 15, a flash flood caught thousands of inhabitants of towns and villages in the Aude by surprise. 14 people were drowned, often in their own homes. At midnight, the tributaries of the Aude showed a depth of 1.6 m. Seven hours later the water had reached 7.68 m. It rose by one metre per hour. And the torrential rain went on. In a region already devastated by the floods of 1999, solidarity forms. From Narbonne to Villegailhec, our crews witnessed the distress of the victims and the skill of the rescue services.